10' abrasion guard included. The guard is flexible and compact enough to wind in with the rope. Comes right back out when you unspool. Move the guard along the length of the rope to guard against rock outcrops, etc. when winching. We recommend one of our larger than stock winch hooks - Self-Locking, Mega, Big Red, or Yellow (as the loop of the rope nestles in a heavy-duty thimble, the clevis opening on your stock hook will probably be too narrow to fit it). We also highly recommend our aluminum Hawse fairlead (HD or SL), specifically designed for synthetic winch rope use (see below). 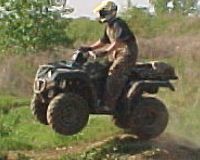 Do not use a roller fairlead to guide your winch rope. It's simple - have the right equipment, so everything works as designed. AmSteel Blue is the latest development of HMPE fiber in a twelve-strand braided rope utilizing Parallay design with proprietary blue urethane coating. 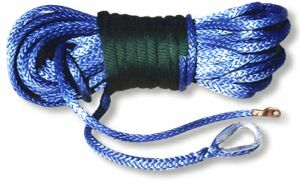 Synthetic winch rope was introduced to the off-road vehicle markets in the 1990’s. 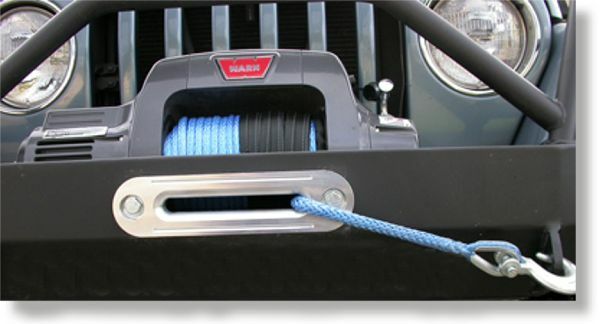 It has rapidly become a must-have accessory for both hard-core rockcrawlers and off-road enthusiasts. .
Rule Book - "Winches must use rope (non-metal) with minimum burst strength of nine thousand five hundred (9,500) pounds." 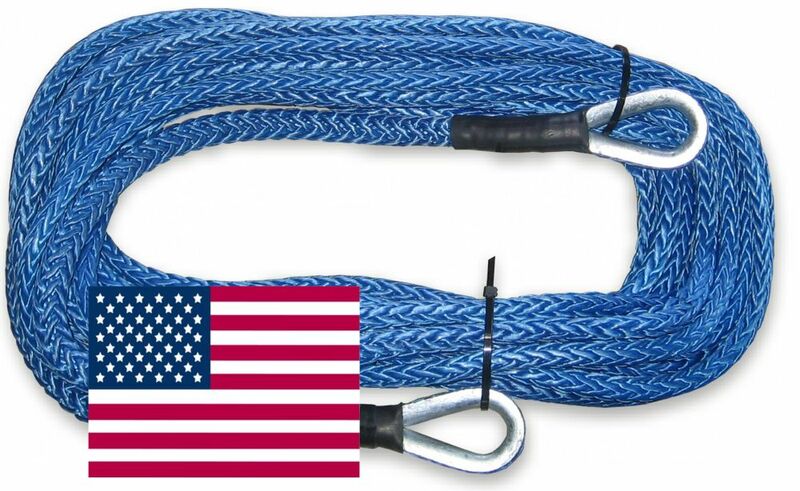 U.S. Made Amsteel Blue synthetic fiber rope has a higher breaking strength than that of steel cable of the same diameter, and remarkably weighs less than 1/6. It won't get all wound-up like cable when unspooled. It can't develop sharp frays, and it doesn't conduct electricity or heat (won't freeze your hands in winter). It won't rust, doesn't kink, doesn't recoil, doesn't stretch, or doesn't store energy. Need we say more! . Note: Our ropes are professionally spliced and crimped. Extra-large terminal end, with rope taped prior to being crimped into the terminal. .
We strongly recommend upgrading to a billet aluminum Hawse fairlead to prevent pinching or other damage from a steel roller fairlead. See aluminum fairlead selections below. Note: As with cable, we recommend keeping a minimum of 8 wraps of synthetic line on the winch drum at all times. CLICK HERE FOR CABLE REPLACEMENT. (click image for large view) . . Note: Compare to 5/16" wire cable with 9,800lb strength, and 3/8" wire cable at 14,400lb strength. .
Total . $224.00 . $314.00 . $299.00 . Don't get stuck too far from a good anchor point! 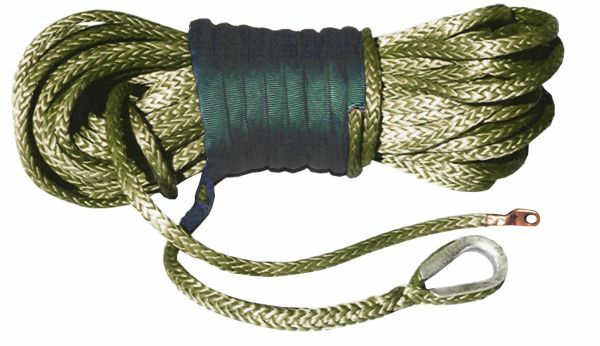 Our winch rope extension adds fifty feet to your winch line, and brings you nearer to that well-placed tree. Weighs less than 1/4 of steel cable. Note: Our ropes are professionally spliced. .
Also made from Amsteel Blue synthetic fiber rope, our extension lines have both ends looped with a thimble. Stores easily in your kit box until needed. This is a wonderful security blanket for anyone venturing offroad anywhere. Total . $139.00 * Total . $179.00 * . Don't just throw that winch rope extension into the back! Store it carefully, and it will be there for you when you need it. pockets, and hard fiber floor. . 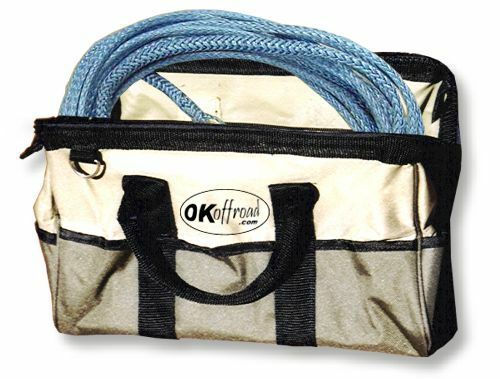 Protect your Amsteel Blue synthetic fiber winch rope extension by storing it in our handy kit bag. Holds your recovery straps too. .
Total . $153.00 * . $193.00 * . 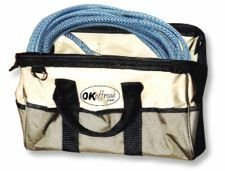 Price Saving: The Recovery kit bag has a retail value of $20. Get it here with your winch rope extension for $14. Our mega winch hook with safety latch is a proven winch accessory. Bigger is really better. Don't wait to upgrade! . Weighing-in at 2.5 lbs, only a fraction of a steel hawse or roller fairlead, our T6 billet aluminum Hawse fairleads are designed specifically for winches running synthetic winch rope. .
Weighing-in at 2 lbs, our T6 billet aluminum slimline Hawse fairleads is only 3/4" wide. Designed specifically for winches running synthetic winch rope. . The self-locking winch hook is the ultimate solution in winching equipment. For the serious recovery specialist. . This hook is as heavy-duty as you will ever need. For use with self-recovery winches up to 15,000 lbs. . Eye Sling Hook with heavy-duty safety latch. Hammerlock included. Proof tested and certified. .
. Note: For your safety and our quality control, winch lines are non-returnable. . .